The first gem from the treasure room discussed in the last blog entry is in the inductions of Brad Yates’ Guided Imageries (GI), where he relaxes and prepares you for the journey. He asks you to imagine a shower of crystal clear water that washes away negative emotions such as fear and anger in order to reveal the true light that is in us all. * While the GI continues on into its adventure, I just want to focus on this one piece where the negativity is washed away. In my mind’s eye, I see those negative emotions wash away and gurgle down the drain as caked on dirt washes away in bodily shower. I can’t even begin to describe how much lighter, freer and more tranquil I feel afterwards because I am not burdened by those heavy emotions anymore. Although each GI is filled with precious healing gems of their own, I sometimes want to linger in that hot shower, enjoying the feel of that psychic sewage sliding off my body and down the drain. Thus, I periodically take the time to meditate on lingering in this shower. Physically, I lie down and relax. Mentally I turn on the shower. One by one, I bring up each negative emotion that has been plaguing me and scrub its dirty mark from my body and watch the dirt slide off and swirl down the drain. I feel the water cascading warmly over my body, cleansing me of all the negativity and relaxing my tired tense body. After about a half hour or so of this, I surface from this meditation feeling cleansed, fresh, rejuvenated, alive and ready to face anything that comes my way. 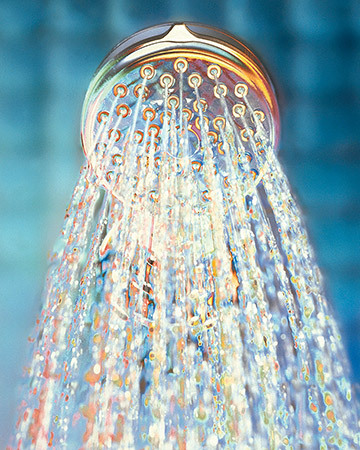 Like we need real showers to keep us clean, I am calling these meditations my soul showers. Whether it be this or a full guided imagery from Magnificent Tappers, I’m finding that my day goes well when I start and end with a soul shower. * A paraphrased part of Brad Yate’s induction to his Guided Imageries found on his Magnificent Tappers website.